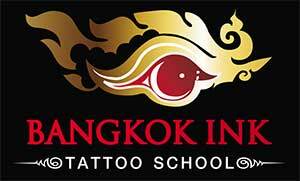 For 10 years Bangkok Ink has been offering training in machine and hand poked tattooing. Taking hundreds of students from all over the world and offering them a chance to learn their trade and open their own tattoo studios or work for other tattoo studio’s. We have focused on a casual experience where students are encouraged to learn at their own pace with guidance rather than instruction. We believe that the best way for people to learn this craft is to work hard in an environment that allows them to explore their own style and ways to progress. We do not teach hand poked tattooing anymore unless you are a special student and willing to take the time out in your life and also prepared for it. We out source this learning with the best teacher we know. Have questions? Read our FAQ page! Modern air conditioned with HEPA air filtration premises to kill all airborne germs. Fully certified by the government to hospital standards. If you would like live updates and follow progress on what our students tattoo on our models, then follow our Facebook Page & Reviews for Tattoo School Thailand which our models have given our students 4.8 stars, that is good. We have come a long way over 10 years and producing some of the best students in the world. Our instructors are the best. We have all the latest techniques which we have developed ourselves in the most modern studio that you can learn in. It has taken many years to get here and a lot of investment, but we have got here. In the past we have had 5 to 6 students at a time in a smaller area. But now we only take 2 students at a time in this big studio. Why do we do that, because we want the best atmosphere and relaxed environment for you to learn in. It is not just about money anymore for us. It is about the Bangkok Ink family and if we all work together then we make money. Take a look at the pictures below. I can not explain how much time we have put in to this to make it work. We only take 2 students at a time so you will have the best experience possible. You will get your own individual area to work from for the duration of your stay with us. Have a look at some of our students amazing work here! Below one of our instructors teaching the student on our own developed practice skin. It take a long time to get that fake skin to work good. 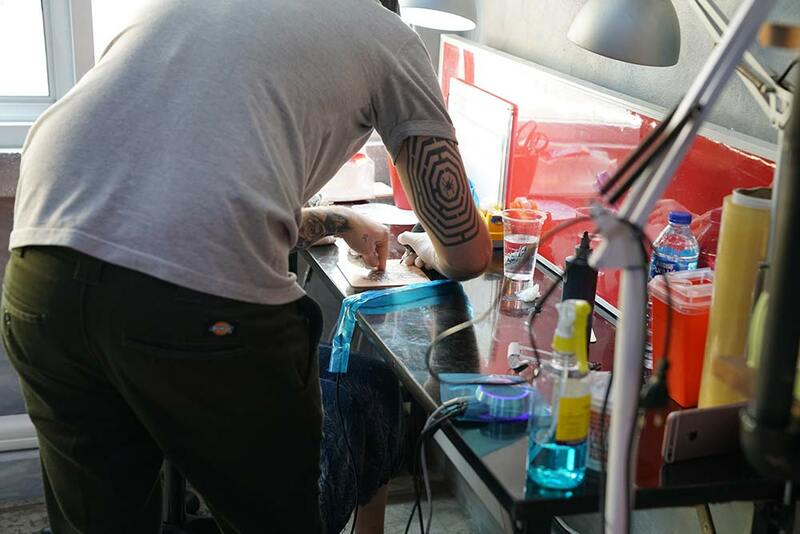 Learn to tattoo and hone existing skills in a casual, fun environment.Our beginners course offers drawing basics, machine and equipment knowledge, tattooing skills, working on live models and hygiene and safety as well as studio etiquette. Return students or tattooists that want to further their skills in an easy going enjoyable environment. Supplies, chair and models provided. 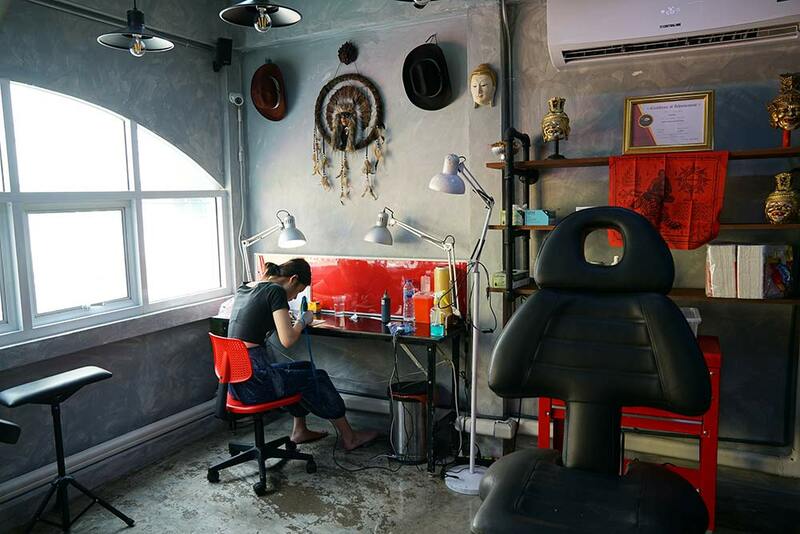 The perfect tattoo course and holiday, enjoy crazy Bangkok and tattoo five days a week. 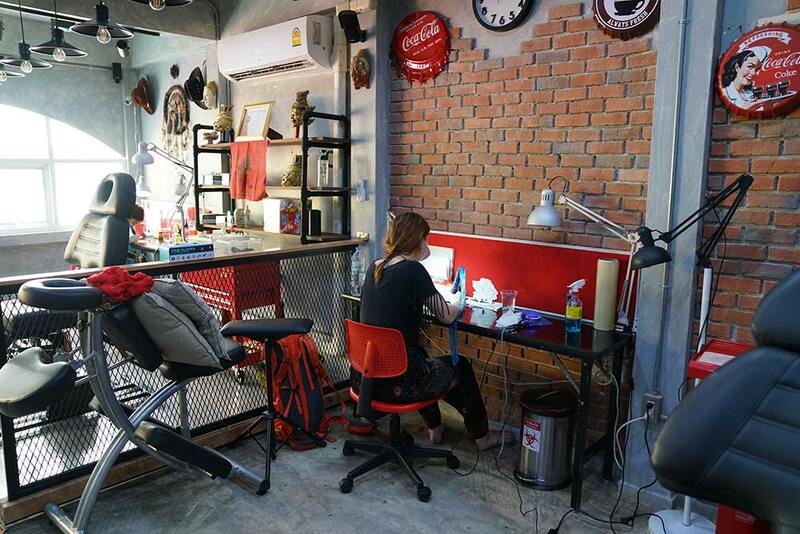 Here at Tattoo School Thailand, we offer our students a comprehensive learning environment, filled with a variety of support and services. 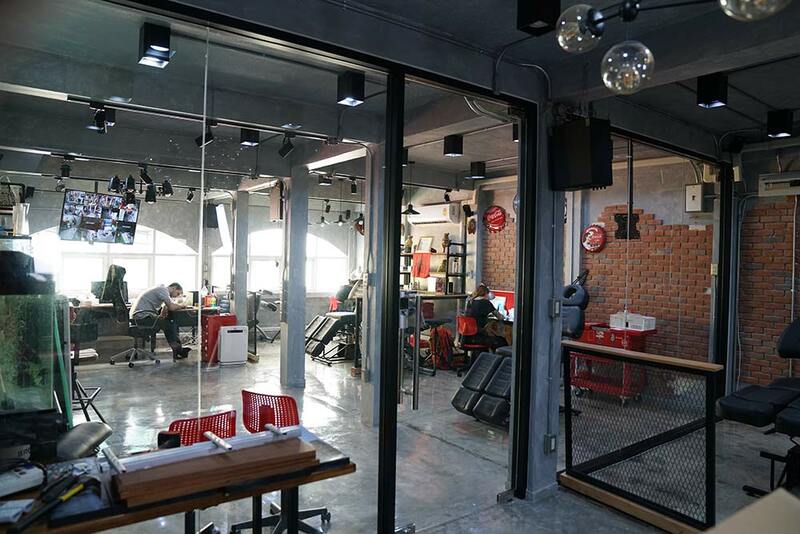 Ever since we got our start in 2000, Tattoo School Thailand has been instilling knowledge in students from the Bangkok area and beyond. Our team members will go the extra mile to give our students the tools needed to grow and succeed. Get in touch if you want to learn more! We do not run classes in the traditional sense. You as a student are given instruction on topics from drawing stencils, machine handling, workstation preparation and basic hygiene and safety.